Chen Xiaoying holds the microphone during a break in the action. Workers direct the evening newscast from the station’s control room. I spent two days job shadowing at ABC FOX Montana, a Missoula TV station owned together by ABC and Fox. Reporter Ashley Sanchez took me along with her as we shot video and did some reporting on a new five-star hotel, The Ranch at Rock Creek, which is the mountains near Philpsburg, Montana. I was able to help Ashley shoot video, and she taught me how to conduct interviews. Being a reporter at a small Montana TV station like ABC FOX Montana is not easy because you have to do everything in the process by yourself. That includes shooting, writing, editing video and driving cars to the interviewing places. Balancing those jobs under time pressure is very difficult. Ashley taught me that we’d better have an plan from the beginning. That helps reporters know what should be shot and how to organize every piece of video. Ashley also taught me how to deal with public relations people, who sometimes want to control the story so it tells the only the message they want the public to know. Ashley said you have to keep a good relationship with PR people, but you have to pick the useful information you want. During my time at the station, I was able to see the whole process of a news broadcast, including cutting news video, writing scripts, editing timelines and broadcasting the news. I really appreciate the opportunity of being involved in the station’s work. Missoula Mayor John Engen answers students’ questions during an exclusive interview with the class. Clem Work photo. 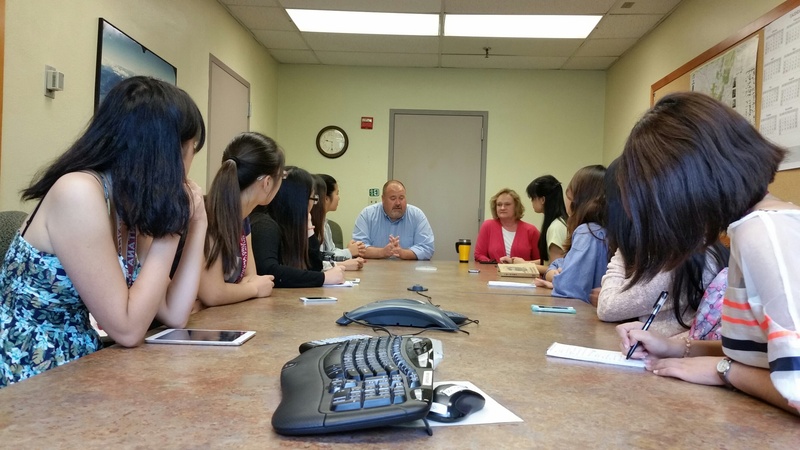 Developing more and better paying jobs and solving the problem of homelessness are two of Missoula’s biggest challenges, the city’s mayor told journalism students from China Monday. 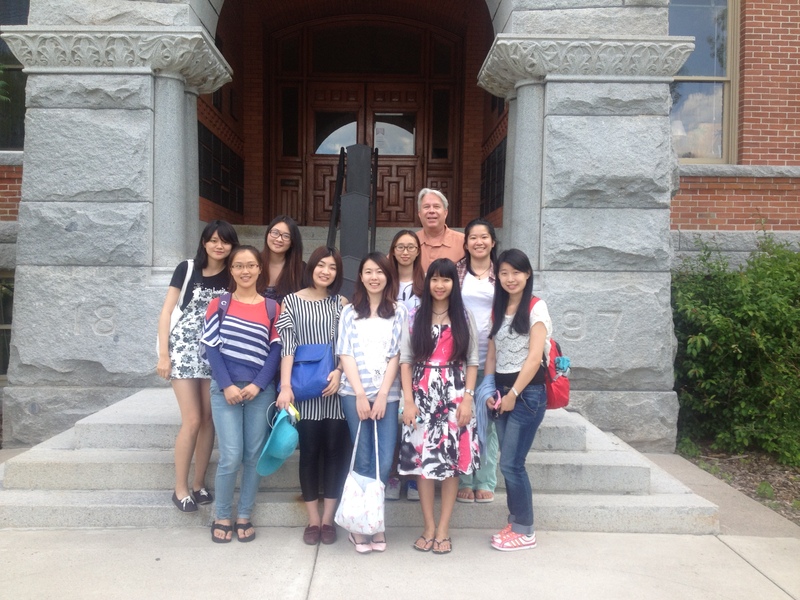 John Engen, Missoula’s three-term mayor and a former journalist, answered questions asked by visiting students from Shanghai International Studies University and by Han Meng, a visiting photojournalist from The Beijing News. Mayor Engen said Missoula’s economy is recovering from the latest recession, but homelessness and underemployment continue to pose problems. He also talked about his administration efforts to be transparent with journalists and public. University of Montana President Royce Engstrom is flanked by the SISU students during his brief visit to class this morning. 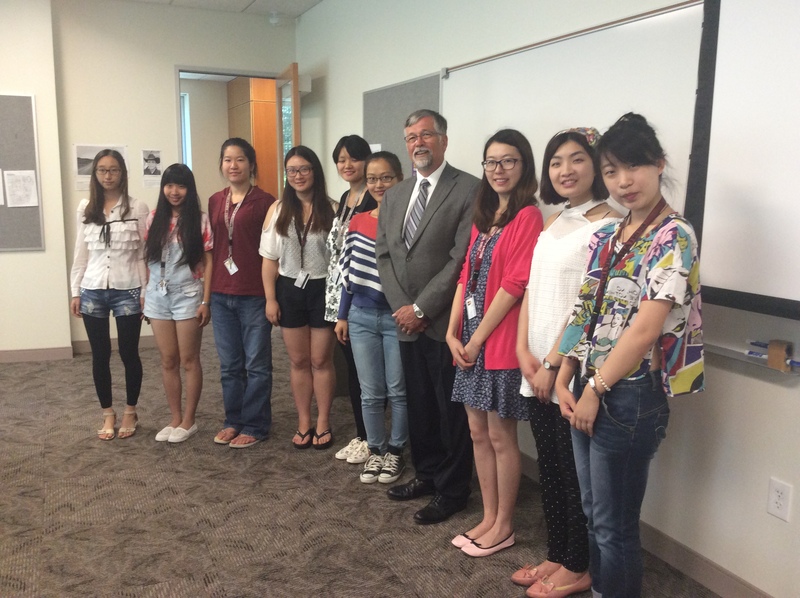 Engstrom welcomed the students to Montana and told them of UM’s growing commitment to global learning. He said has been to Beijing and he hopes someday to visit Shanghai. SISU students and their hosts, Professors Clem Work and Dennis Swibold and UM graduate student Laura Scheer, traveled to the reservation of the Confederated Salish and Kootenai Tribes on July 4, 2014. 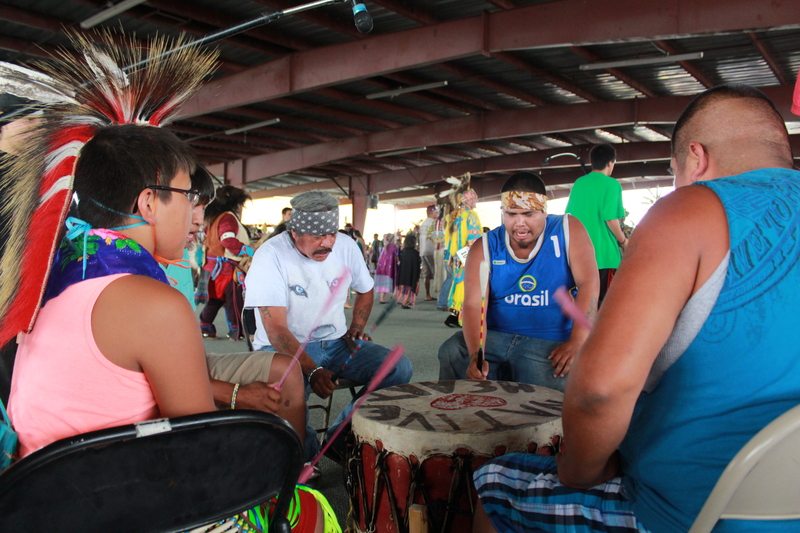 They attended the tribes’ 116th annual Powwow, a celebration of the tribal community and its traditions. The festival included dancing, singing, drumming, arts and crafts, and foods such as fry bread.